I debated whether to have a word for the year as the last two have been hit and miss. The word for 2017 was Salah (prayer) with the intention of improving my concentration in and the quality of my prayers. This has something I have always struggled with and will continue to work on. The word for 2016 was health with the intention of improving my diet and losing a little weight. I did improve my diet and lose a little weight, but I remain in the thrall of chocolate. On consideration I realised that part of the problem is that I am choosing areas of my life that I should improve rather than want to improve. Ones that feel like real work and require discipline and will power, rather than ones I can enjoy focussing on and feel motivated to improve. So this year I thought about an area of my life that needs work and the one that stood out was my understanding and study of the Quran. 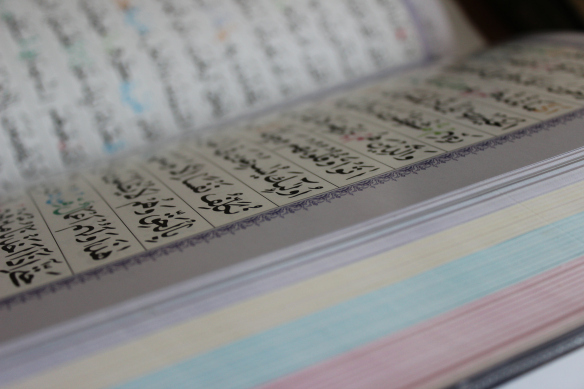 I have felt keenly in recent years that I cannot justify not knowing, studying and understanding the Quran better. I love to learn and study and if I take the approach to learning the Quran that I am increasing my knowledge in order to implement what I learn in my life, then I hope this will motivate me. Saying that, I know that studying the Quran is important and something we should do. This Word of the Year (Quran) is the one for my head, I hope as the year progresses, it becomes the one for my heart also. I hope to start with the commentary called Tafsir ibn Kathir which hubby gifted to me and then look at options for further study or for learning Quranic Arabic insha’Allah. The other Word of the Year, the one that come from my heart and feels like fun more than work, is Khidmat, or service to others. I believe that we all have our own strengths when it comes to spirituality and faith. There are those that engage in zikr (remembrance) and reflection, others that can remain absorbed in prayer for long stretches with concentration and devotion. Some people are able to live in a simple, even austere way, treading lightly on the earth and others make an impact on everyone they meet through their compassion and kindness. I have always struggled with prayer, over time I have found zikr easier and more pleasurable. In comparison, I have always loved to help others if I can. I believe that this is my path to Allah (SWT) more than any of the others. I will look out for opportunities to benefit others and make positive intentions insha’Allah. I have wanted to volunteer for some time but will have to consider what capacity I have. Other avenues are cooking for others, taking care of and supporting my parents, caring for my mother-in-law when she is here, visiting someone new to the area or a new neighbour, visiting someone who is ill or alone, sharing my knowledge with others - a few people have asked me to help with job applications and forms. I hope to keep an open mind and see what comes my way. What would your word or phrase for 2018 be? What do you want to bring your focus to this year?